It was a shock when Larian Studios announced Divinity: Fallen Heroes. It was the day before PAX East, and I expected to see Divinity: Original Sin 2 - Definitive Edition in Larian's booth again. Even after the announcement, I thought that Divinity: Fallen Heroes wouldn't be playable on the showfloor. But no, there it was, calling to me like a beacon. I love tactics strategy games and I love Divinity: Original Sin 2, so Divinity: Fallen Heroes is the perfect announcement to me. 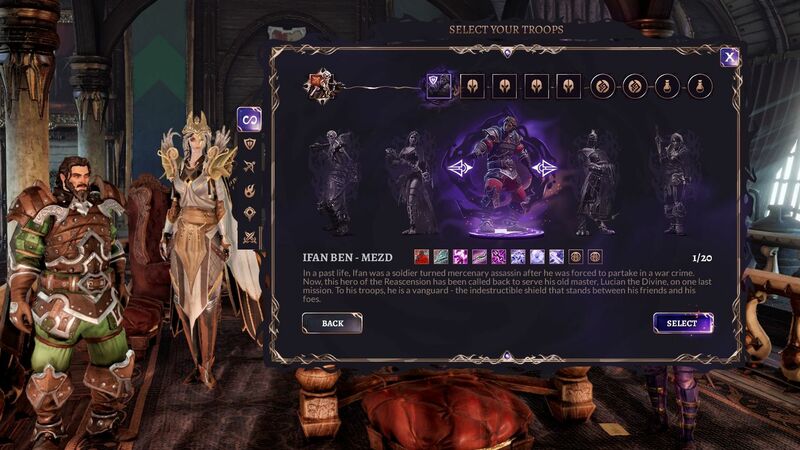 Fallen Heroes picks up after the events of Divinity: Original Sin 2, and features all of your favorite Godwoken heroes. Ifan Ben-Mezd and Lohse feature heavily in the playable build, but the Red Prince also appears, and I caught a glimpse of one mission with Fane. Malady is also back, under your custody as the unnamed Commander of the Godwoken. When you're not out on the battlefield, you're looking at your advisors and the war table. Larian says that the ship from Divinity: Original Sin 2, the Lady Vengeance, will return and be upgradeable over time. It's here that you'll also make a number of narrative decisions. For the first mission in the demo, I'm given the choice to reinforce the fort containing Lucian the Divine, or head to the harbor to help out citizens. Ifan is arguing heavily to back up Lucian, while Lohse is giving me the side eye for even entertaining the idea of not help the people. Divinity: Fallen Heroes is based around these narrative choices. Who will you help? Who will you fail? As you make decisions, your Godwoken heroes will shift in response. You'll spend a lot of time on the Lady Vengeance, talking to your crew and getting into their feelings about your actions. It's not just about what you want to do, it's about managing these different internal factions. Long time Divinity fans will recognize this meta gameplay loop from a previous game. "We were looking for some time to mix Dragon Commander with Original Sin. Since Original Sin, we've thought that Dragon Commander's problem was its combat. Everything that happened on the meta gameplay, people liked. But we never had the time to do it," Larian Studios founder and CEO Swen Vincke tells USG. After the wild success of Divinity: Original Sin 2, Larian Studios still didn't have the time to 'fix' Dragon Commander, but it did have the resources. According to Vincke, Larian Studios approached Logic Artists, the Danish developer behind Expeditions: Conquistador and Expeditions: Viking to handle development of the project. 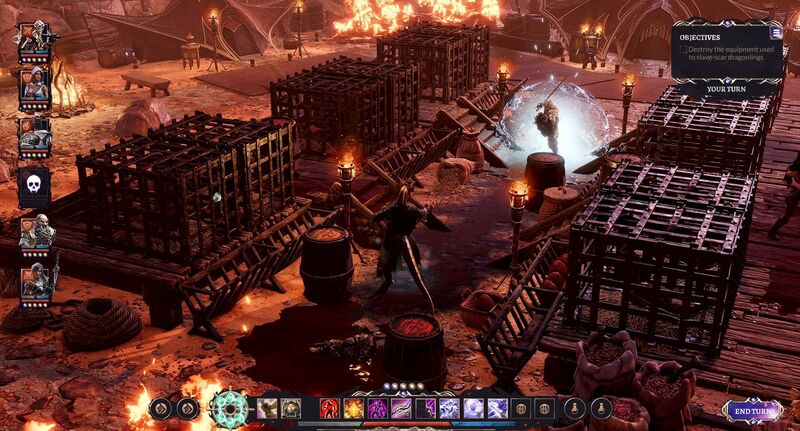 Logic Artists has been prototyping on the concept since June of last year, with the last prototype being so good that Larian decided to bring it to audiences. Once you've chosen your course, you then have to build your squad. In Fallen Heroes, your squad will be led by a hero, one of your Godwoken crew (and Malady!). They have skill trees and approval ratings, which both will determine how they work on the battlefield. After that, you'll choose a group of nameless squad members, including a Mage, Healer, and Archer. These squad members use some of the abilities from Divinity: Original Sin 2, but they're a bit more vanilla and straightforward in the current build. Once you've picked your crew, you also have a host of consumable items to choose from that can help turn the tide of battle. One example is the Endless Apple, which restores one character to pristine condition, or Prism of the Planes, which lets you drop a limited-use portal on the battlefield to quickly move from location to location. If you've played Divinity: Original Sin 2, combat is largely the same: same general movement, same action points, and the same focus on elemental damage. What's changed is there's no longer a turn order: instead, you make decisions for your entire squad, end the turn, and then the enemy forces make all their choices at once. In practice, this means that it's slightly easier to set up combos, like dropping oil on the ground with one character and setting it on fire with another. The flip side of this is if you push too far ahead, you'll find a character quickly overwhelmed. I lost my archer to an enemy dogpile, and another change made itself apparent: there's currently no way to resurrect a dead unit. Larian is still going back and forth on whether that'll remain the case, but at least in the show build, it made your choices feel final. I already see myself playing Fallen Heroes a bit more cautiously than I did in Original Sin 2. There's facets to the battlefield as well. There's Sulfurium, a new element that can be spread on the ground. It reacts to kinetic energy. Throw an enemy on it, and they'll bounce. Shoot it, and it explodes, dealing physical damage. Savvy players can also use it to get around the battlefield. Larian Studios and Logic Artists came up with a new weapon type to fully utilize the new element: guns. Guns and blunderbusses deal direct damage and knock back, making them slightly different from bows. "Sulfurium was a surface that we've been experimenting with. It's the kind of thing we've been looking for because it has a very systemic usage, because it creates those physical shockwaves that throw you back. It reacts to any kinetic energy. If you shoot a crossbow at it, you're rocket jumping," says Vincke. "Blunderbusses and guns came up very rapidly. They're cool because they have this throwback effect. So we've played with verticality even more than we did in Divinity: Original Sin 2." And they're still working on Fallen Heroes, but it's likely that there will be a Sulfurium Incarnate, according to Vincke. There is a Sulfurium skill tree that's in development. The first mission in the build introduces guns on the enemy side, allowing them to push back my soldiers on the battlefield. They're still like bows in that its line-of-sight is still key, so teleports and stuns can keep gun wielders from controlling the battlefield. My Original Sin 2 skill did carry me through the first battle, ending in a fight against the Void version of Lucian the Divine. I won, though everyone except my chosen hero Ifan died horribly and was resurrected as bloated undead corpses by the boss. It was a tough round. Visually at the moment, Divinity: Fallen Heroes looks a whole lot like Original Sin 2. It's definitely built on the Original Sin 2 engine, but both studios are working hard to add new artwork and new skills to the game. This isn't just Original Sin 2 with slightly different combat. "Everything that you're seeing onboard the Lady Vengeance is still very much placeholder. It's much easier to use the existing assets to test the game. In combat, there is still asset reuse, but there's a lot of new stuff in there also. There is new artwork, new environments: you'll head to the icy north, you'll head to the desert lands of the ancient empire. You're going to have a new journey," says Vincke. One thing that Larian Studios and Logic Artists are trying to avoid is grinding. Many tactics games see players heading into the same handful of missions and levels to grind. Vincke says that Fallen Heroes is trying to make each mission more meaningful, while also keeping the player at a level that feels challenging. "I play a lot of tactics games, and a lot of them grind. That's because there's a lack of diversity and you keep on doing the same thing. One of our briefs is that we should avoid this. Each mission has to feel different. I really want to play [a tactics game] where story and choices are important, but I also don't want have the same experience twice," he tells me. Divinity: Fallen Heroes has no release date, with Vincke saying it'll be out "when it's ready." He also promises that Larian has "a lot of ambitions" for Fallen Heroes. And when asked about Larian Studios having more suprises like Fallen Heroes in the future, Vincke promises that there will be "big ones." 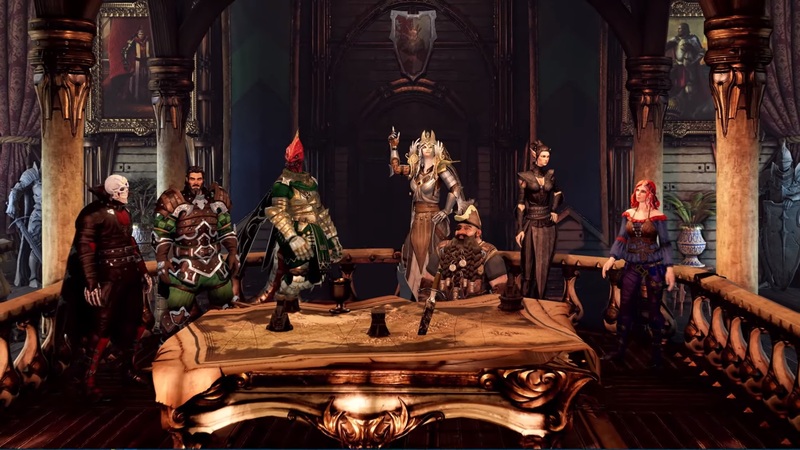 Tagged with Larian Studios,	Opinions,	PAX East 2019,	PC,	Role Playing Games,	Strategy.